All parts of the world celebrate the harvest and so do the many gardeners who call Dave's Garden home. The County Fair is a longstanding agricultural and handicraft tradition that gives gardeners, farmers and artisans the opportunity to showcase their work to the community. 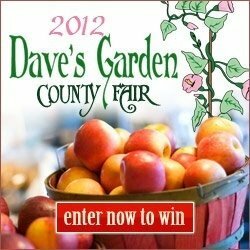 We're honoring this popular harvest tradition with our own virtual County Fair happening here on Dave's Garden! Time to vote! Vote for your favorite photos in each category. Use this link to vote for your favorite recipe Don't delay - voting closes on October 1, 2012 at 8 pm PDT.